The Rand has weakened somewhat over the past two months, by around 6% on a real trade-weighted basis. Much of the 9% depreciation in the Rand/Dollar exchange rate can be attributed to Dollar strength and increased risk aversion towards emerging markets as manifested by the fact that the Rand has not weakened as much as some other emerging market currencies have done over this period. However, there are two domestic factors which could begin to weigh down on the currency in the next few weeks and months, viz. poor GDP data for the 1st qtr, which could reverse recent favourable international sentiment which has seen South Africa as a wonderful “turnaround” opportunity for investment in emerging markets following the election of Cyril Ramaphosa as president. Secondly, pressure on the South African government to give in to trade unions demanding higher wage increases than had been built into the Budget for 2018/19, could upset ratings agencies and lead to renewed fears of further credit ratings downgrades down the line. Both these developments have the potential to cause the Rand’s exchange rate to depreciate further in coming months. Analysis of the movements in the value of the Rand over the past few years indicates that the South African currency succumbs to different forces from time to time, some domestic and some international. The weakness in the Rand over the course of 2015 can largely be attributed to the strength of the Dollar on expectations of a tapering off of quantitative easing in the US and the likelihood that US interest rates would begin rising relative to interest rates in most other countries. Suspicions that the Chinese economy might also slow significantly, as messaged by the decision by the Chinese authorities to allow the Yuan to depreciate instead of being fixed to the Dollar, added to such expectations and contributed towards the final steep fall in commodity prices. Being seen as a primary commodity currency, the Rand depreciated sharply as a consequence. When it finally crashed on the announcement of the firing of Nhlanhla Nene as Finance Minister by then President Jacob Zuma, this was interpreted as being a domestically-driven weakness in the currency. However, arguably, it would not have fallen so steeply at the time had it not been for the global backdrop that was unfriendly towards emerging markets and commodity-driven economies like South Africa. From the end of January 2016, however, the global environment turned for emerging markets towards a much more positive dispensation. Fears about Dollar strength dissipated in the face of data showing weakness in the US economy which would inhibit the extent to which the US would raise interest rates. Such perceptions have followed a sharp rise in oil prices (associated in part with the withdrawal of the US from the nuclear treaty with Iran) and protectionist tariffs imposed by the Trump administration upon imports into the US. Over the past week specifically, concerns about the Eurozone in the face of a possible election of a right-wing anti-EU party in Italy, have contrived to strengthen the Dollar and weaken the Euro and other emerging market currencies. However, closer analysis of the rates of depreciation of emerging market currencies over the past week shows that the Rand has once again tended to weaken more than most of the other currencies. This suggests that domestic factors might once again have returned to play an important role in softening the South African Rand. It would appear that some of this weakness might be attributed to growing recognition of the likelihood that the GDP growth rate for the South African economy in the 1st qtr, which is due to be published in a fortnight’s time, could turn out to be substantially weaker than had been anticipated and might even be negative. Such an outcome would come as a shock to many international investors who have been seeing South Africa’s economy as a “turnaround” situation following the election of Cyril Ramaphosa and better-than-expected improvements in GDP growth during the course of 2017. The shock of a negative 1st qtr 2018 GDP growth rate could come as a reality check to such investors and capital outflows could ensue. Expectations of negative growth in GDP for the 1st qtr stem from the publication of monthly data for the first three months of the year in respect of mining, electricity and manufacturing production, retail and wholesale trade sales and building plans completed. If one assumes that the changes in production or sales on a q-o-q basis for the first three months of the year compared with the last three months of last year translate into commensurate changes in value added (GDP), then one recognises that each of these sets of data stands to translate into a negative impulse on 1st qtr GDP growth. The decline in mining output could exert downward pressure on GDP growth, of -0.3%. In the case of manufacturing production, the decline from growth of 2.0% q-o-q in the 4th qtr of 2017, to -1.3% in the 1st qtr of 2018 translates into possible downward pressure on overall 1st qtr GDP growth, of – 1.5%. In the case of retail sales the downward pressure could be as much as -1.3%, whilst with wholesale trade sales, it could be -0.3%. Then there is an additional potential downward pressure from electricity production, of -0.1% and from building plans completed, of -0.3%. Cumulatively, if one adds all these negative influences on 1st qtr GDP growth, they amount to -3.8%. This is far greater than the 3.0% q-o-q seasonally-adjusted annualised growth recorded in the 4th qtr of 2017 and suggests that 1st qtr GDP growth could come in at -0.8% other things equal. One cannot be sure that changes in the remaining sectors such as agriculture, transport and communications, financial services and general services might contribute towards neutralising some of the negative impulse from the other sectors mentioned. However, one doubts that this will be the case. 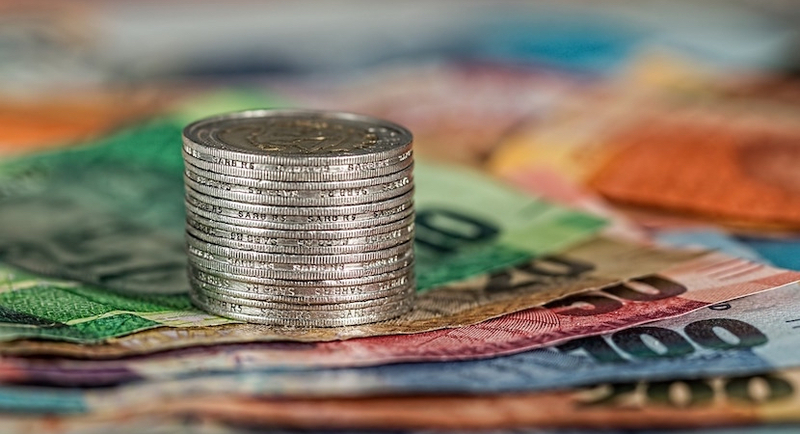 The second potential negative domestic influence on the Rand is the growing recognition of an impasse between government and public sector trade unions over the negotiation of a new three-year wage agreement. The expenditure budgets outlined in the February Budget for the next three years were based on expectations of an increase in the public sector wage bill of 6.9% this year and slightly in excess of 7% in subsequent years. These figures are based on the award of a CPI +1% increase to lower level public servants and slightly less for public servants at high levels. The unions are demanding increases of between 10% and 12% and have “compromised” more recently by suggesting increases of CPI +2% for lower paid public servants, with the assumption of CPI at 5.5%. In other words, they are pressing for increases of at least about 1% above what the government is bargaining for. Given the magnitude of the public sector wage bill of just under R500bn, the award of an additional 1% pay rise for public servants in the absence of any reduction in the size of the workforce in government greater than what is currently contemplated, would translate into an increase in the budget deficit of R4.9bn, or 0.1% of GDP. The award of such an increase might well be regarded by credit ratings agencies as the litmus test to determine how committed the government might be on fiscal discipline. It would therefore risk generating an increased chance of further credit ratings downgrades later this year or early next year. As it is, S&P has admitted that its reason for downgrading South Africa’s credit rating to junk status last year was because the agency had tired of listening to pleas by the National Treasury that its overshoots of budgets time and again were temporary and would be reversed in due course, something which never happened. 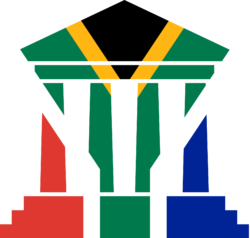 One is therefore nervous that the development of tensions in these public sector wage negotiations and a possible breach of budgets in order to accommodate larger-than-anticipated wage increases to stave off strike activity, could well bring about renewed weakness in the Rand out of fear of Moody’s after all downgrading the country’s credit rating to junk status next year. The fear of South African government bonds falling out of the World Government Bond Index, might come to be resurrected, with adverse implications for capital outflows and the Rand. For these reasons too, one should not be surprised should the South African currency breach the R13 level sometime in the next few weeks. This should not be seen as necessarily implying a collapse in the South African currency to levels of R15 or more to the Dollar, but does feed into our narrative of the Rand having more downside than upside potential. NOTE: The above exposition was completed on Friday prior to the latest sell-off in the South African currency. Part of the latest sell-off could well have been driven by the factors outlined above as being potential contributors towards Rand weakness. However, further softness in the currency can still be foreseen. Azar Jammine is Chief Economist at Econometrix. 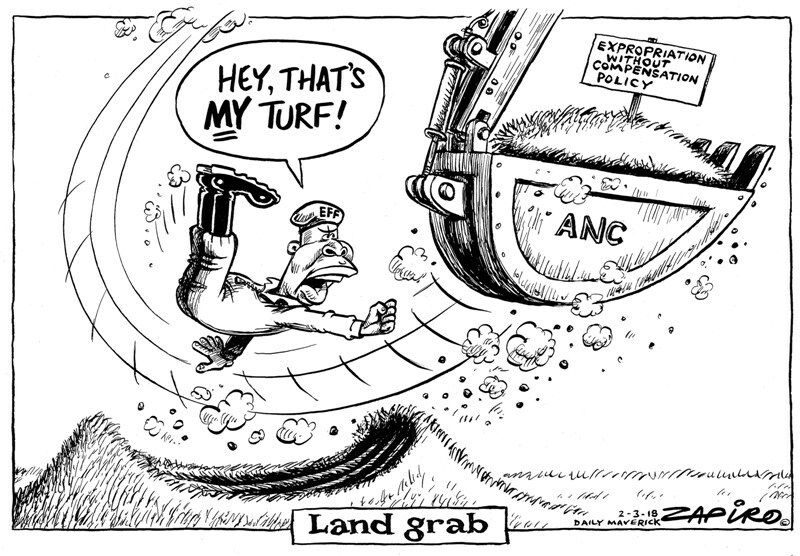 Many people have been hoping that President Cyril Ramaphosa is ‘playing a long game’ on expropriation without compensation (EWC). They believe that he opposes it, but has to move slowly in isolating the radicals within the ANC so that he can ultimately neutralise the organisation’s decision, taken at its Nasrec national conference in December 2017, to endorse EWC. However, what Mr Ramaphosa said at the ANC’s land summit held this last weekend should put paid to any lingering hopes that the president is trying to defeat the EWC idea. All that party members have yet to agree is whether Section 25 of the Constitution should be amended (when EWC can be achieved under ordinary legislation) and ‘whether all land should be nationalised’. A belief in the president’s supposed long game has persisted up to now, despite the statements that Mr Ramaphosa has made from time to time in support of EWC. At one point, for example, he claimed that EWC would help usher in a ‘garden of Eden’. At another time, he suggested that EWC was urgently required because black South Africans own only 4% of agricultural land (as supposedly confirmed by the state’s most recent land audit). In addressing the land summit, Mr Ramaphosa made a number of equally fallacious claims. These have no foundation in fact, but are clearly intended to blow smoke in people’s eyes and hoodwink them into believing that EWC will be good for the country and its people. The president began by resuscitating the land ownership figures that applied for much of the apartheid era, and then implying that little has changed since then. Mr Ramaphosa spoke of 87% of land having been reserved for the white minority, while only 13% had been made available to the black majority under the Land Acts of 1913 and 1936. 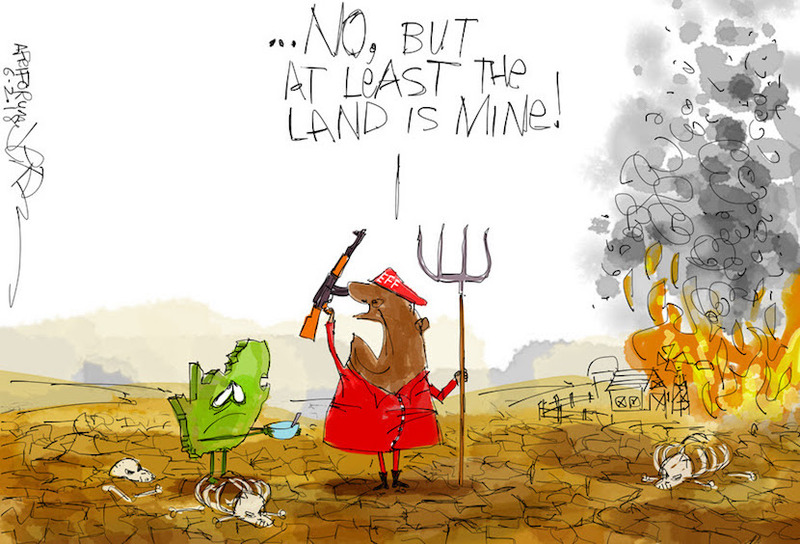 This land injustice is real, but to suggest that the 87:13 ratio still applies is to ignore the land long held in state ownership, the additional land bought by it for land reform purposes, and the private land purchases made by black South Africans since the Land Acts were repealed in 1991. It also overlooks a comprehensive land audit recently conducted by Agri SA and published in November 2017. This audit put the total amount of land owned in 2016 by the government and ‘previously disadvantaged individuals’ (PDIs) at 43 million hectares or 35% of the country’s land area. Mr Ramaphosa then went on to say that ‘when you return land to those who were forcibly disposed, you unlock its real economic value’. This overlooks the fact that that land is only one out of a host of factors needed for success in farming. No less important are experience and entrepreneurship, along with working capital, know-how, machinery, labour, fuel, electricity, seed, chemicals, feed for livestock, security, and water. This list helps explain why so many land reform projects have failed. As former land reform minister Gugile Nkwinti has himself acknowledged, at least 73% of restored land has fallen out of production. In all these instances, the return of land has neither ‘unlocked its real value’ nor done much to benefit its recipients. Mr Ramaphosa then went on to say: ‘To our people, indeed to all people, land is about dignity, it’s about identity, it is about security’. However, there are many small and prosperous countries where land is limited and most people cannot rely on it to get ahead. Singapore, for one, is a tiny city state, but its average annual income per capita – from enterprises generally unrelated to land – far exceeds that of many land-rich countries. In South Africa, moreover, people will not have their ‘dignity’ enhanced if EWC results, as is likely, in increased poverty, joblessness, and hunger. There will also be little ‘security’ for ordinary citizens under EWC, for land will then be vested in the state and will be used by it as a patronage tool. Mr Ramaphosa also stressed that the country’s assets, including its land, have always been owned and controlled in a way that has ‘prevented the extraction of their full value and potential’. EWC, he suggests, will reverse this for the benefit of all. Apartheid was, of course, a massive brake on the economy. So too, however, is the ‘national democratic revolution’ (NDR) which the ANC and its communist allies have been steadily implementing since 1994. The aim of the NDR is to take South Africa, by gradual and implemental steps, from a predominantly free market economy to a socialist and then communist one. The ANC thus has little interest in the success of the free market. Since it came to power, it has been intent on hobbling the market economy and preventing it from delivering the inclusive prosperity that Singapore and other economically free countries have been able to achieve. The current EWC proposal is integral to the ANC’s long-term NDR goals. EWC is not about providing redress to black South Africans for past land injustices. Nor is it aimed at transferring ownership and control from white to black South Africans, as ANC propaganda constantly suggests. Rather, the real goal is to transfer the ownership of land and other key assets from private holdings to the state. Once land and other assets are vested in the state, they are hardly likely to become more productive than they are at present. Far from (magically) starting to deliver on their ‘full value and potential’ (as Mr Ramaphosa says), they are likely to prove as inefficient, corrupt, and cash-strapped as Eskom and other state-owned enterprises. Will either ‘Ramaphoria’, or the widespread belief in the president’s long game against EWC, still persist, despite the president’s weekend statement that ‘we are going to take land and we are going to take it without compensation’? Perhaps it will, for some commentators seem to assume that Mr Ramaphosa has now convincingly demonstrated the economic gains to be made from EWC. The rand reacted badly, however, dropping from R12.50 to R12.80 to the dollar in response to Mr Ramaphosa’s comments. Many South Africans might still want to cling to Ramaphoria, but the markets are not so easily convinced. Dr Anthea Jeffery is Head of Policy Research at the IRR, a think tank promoting political and economic freedom.